You tap your access card across a sensor, a secured door opens and you step into a temperature and relative humidity controlled wine cellar that holds your treasure of Bordeaux & Burgundy. Here you will find Lock+Store’s wine storage lockers/rooms. The temperature is a constant 13 degrees celsius and relative humidity is 70%, protected by insulation all round. This is a SECURED wine storage cellar needed by every connoisseur in a country like Singapore where temperatures can soar to 34 degrees celsius with relative humidity in the high 90s; factors that would render a Chateau Lafite undrinkable. 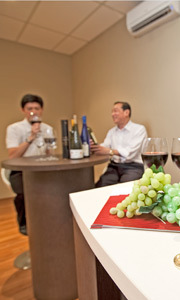 Moreover few wine lovers have enough room for their precious wine collections in their homes.